The 4 Pillars Gallery holds ten to twelve shows per year featuring local and regional artists of all types and all media. 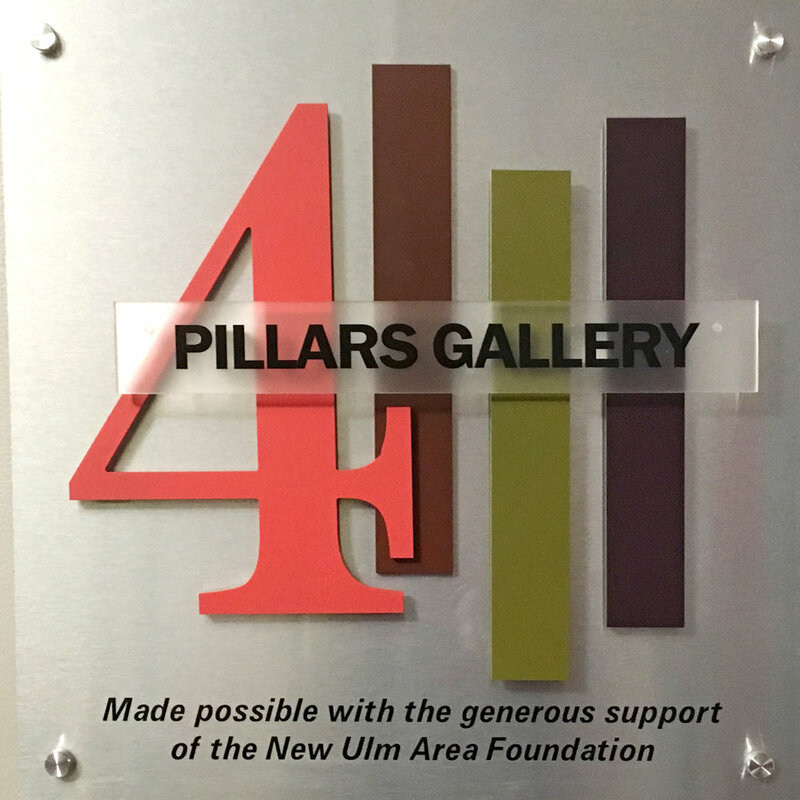 Thank you to the New Ulm Area Foundation for providing funding for our state of the art gallery and lighting, which is the only one of its kind in New Ulm. · Typically a four week show in the 4 Pillars Gallery at the Grand Center for Art and Culture. · Grand Center of Art and Culture Hours are Tuesday – Friday 10AM – 4PM and Saturday 11AM – 3PM during exhibit run. · Artists are encouraged to make your work available for sale. · Any pieces sold are subject to a 30% programming fee. · We will create and distribute full-colored exhibit posters in and around the New Ulm community. · We will create and display posters/advertisements within The Grand Center for Arts & Culture building, including our Kabaret. · We will market via all GCAC social media sites including, but not limited to: our website, our Facebook page, Instagram, and email newsletters. · We will write and submit a formal press release to The New Ulm Journal, The Mankato Free Press, and other surrounding news sources and communities. · We will provide assistance hanging the show (if desired). · We will provide a formal opening reception, including refreshments and light hors d’hourves, that will be free and open to the public. Our openings are scheduled on a Friday, usually from 7-9 PM. · We will provide gallery supervision for the duration of the show, but greatly encourage the exhibiting artist(s) to volunteer some hours supervising the show and attend the opening reception. · We will sell and pay taxes on any art work sold, including accepting credit cards and paying those fees. Additional advertising (such as postcards, flyers, etc.) is allowed, but is at the exhibiting artist’s expense. The Grand Center for Arts & Culture logo must be present on all promotional material and can be provided upon request. Any additional mailings requested by the exhibiting artist will be charged an extra mailing fee if using The Grand and/or our mailing list. A brief artist meeting will be scheduled between The Grand and the artist (phone or in person) and take place prior to one month before the exhibit opening. The guidelines, artwork, and artist’s contract will be reviewed and confirmed at that time. The Gallery show fee is due prior to that time. If you have any questions or comments during the process, please contact The Grand Center for Arts & Culture via phone, email, or by visiting our office. Please complete the information below and we will be in touch regarding exhibiting in the 4 Pillars Gallery. PDF version available here.